The store-bought wallet I’ve been carrying for a while got a broken zipper recently. I’ve made wallets successfully in the past, but I was kind of tired of the same pattern, plus the cards always seem a little loose in that one. I decided to try a wallet pattern in the Fabric-by-Fabric One-Yard Wonders book. (Am I developing a slight obsession with those books and their yarn counterparts? I hope not, but maybe. They do always seem to be just-the-right-size projects for the time I have available.) This wallet is supposed to be made out of quilting-weight fabric and interfacing, but I had canvas I wanted to use, partly because of the sturdiness and partly because I had this color scheme in mind. 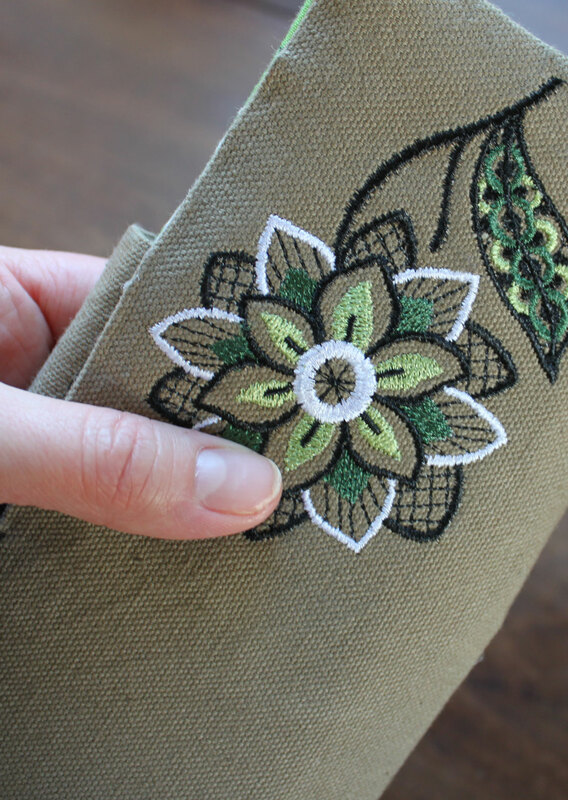 I purchased an embroidery file that I thought coordinated with the black and green fabric I wanted to use for the inside. The pattern was easy enough to follow, and I thought the machine embroidery turned out well, and did coordinate with the lining fabric. 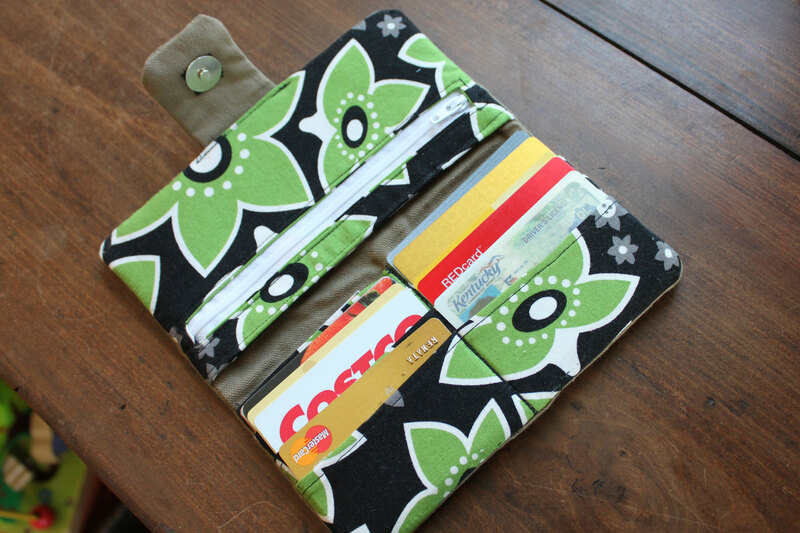 The problem came when it was time to topstitch around the whole almost-completed wallet. The bulky ends of the my canvas made the edges of the wallet too thick for my machine to sew over. I tried it anyway, and it looked awful. Then I realized I also didn’t have enough room to slide my cards inside. I followed the pattern and the seam allowance faithfully, but perhaps my canvas added too much bulk in that regard too? In any case, I had to rip out all the black topstitching around the whole wallet. It was a beast, and it caused snags in my fabric in several places and even one tiny hole in a prominent corner. Sigh. And I’m out of the lining fabric again. Seam-ripping is the worst! The wallet still functions acceptably well, and the places that were damaged due to my ripping out the topstitching could pass as minor wear marks, which a wallet would certainly collect quickly anyway. I’m going to use it for now, and see if my motivation comes back around to try another one in a different style (and different pattern) sometime soon.